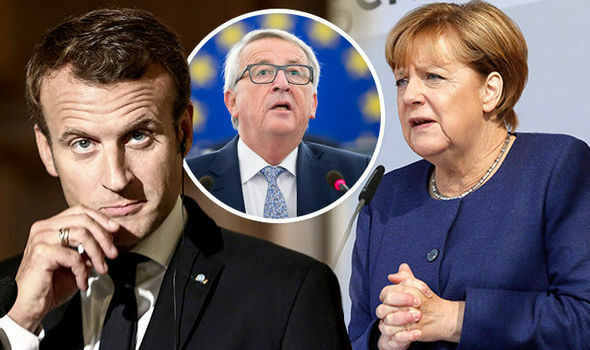 FEDERALIST dreams of a more deeply integrated eurozone stand on a knife-edge this week as eurocrats nervously await the outcome of a German election which could determine the future of the bloc. Whilst Angela Merkel’s party will almost certainly romp home in first place, all eyes are now on which of several smaller parties will secure enough votes to win a place in her next coalition. The current frontrunner for junior partner is the Free Democratic Party (FDP), a centre-right, free market orientated movement that has put sealing a Brexit trade deal at the heart of its agenda. However, whilst a strong FDP showing in Sunday’s election would be music to the ears of politicians in Britain, it would be a disaster for europhiles committed to deepening economic integration. Last week EU Commission chief Jean-Claude Juncker laid out ambitious plans for reform of the troubled eurozone, including the creation of a European Monetary Fund and EU finance minister. The proposals are straight out of Emmanuel Macron’s blueprint for the future of the bloc, which he has been enthusiastically selling to Berlin ever since his election in April. The French president appears to have had some initial success, with Germany thawing on the idea of a ministry to oversee eurozone finances, but all that could be undone in minutes on Sunday. One leading economist said all the pair’s ambitious plans for economic convergence would be “dead in the water” if Mrs Merkel has to turn to FDP to make up her next coalition Government. Christian Odendahl, from the Centre for European Reform think-tank, labelled a pact between the Chancellor and the FDP “the most dangerous coalition for the euro”. Senior figures within the pro-business party, which was a junior coalition partner when the Greek bailout deal was agreed, how vowed they will never again green light any proposal that could lead to pooling of EU countries’ debt. Instead, they want to see the bloc adopt a bankruptcy mechanism which would see struggling member states booted out of the single currency so that others do not have to bail them out in future. The issue of Greece’s mounting debt is a political hot potato in Germany, where many voters are highly wary of being drawn into further costly payouts to Mediterranean countries. To guarantee this position the centre-right party will seek control of the Treasury as its main demand in political negotiations to form a future coalition with Mrs Merkel’s Christian Democratic Union (CDU). The FDP is not eurosceptic in a British sense but instead prioritises the German economic philosophy of “Ordnungspolitik” – which is based on a strict adherence to free market principles. And Ms Beer said that the “decisive question” in Sunday’s election will be which party ends up as the third largest in the Bundestag and in doing so secures a place in the next Government. Mrs Merkel has already ruled out working with two extreme parties - the far-right Alternative fur Deutschland and hard-left Die Like, meaning she has a choice of just the FDP or the Greens. In the latest opinion poll the CDU is way out in the lead on 36 per cent whilst the FDP is on 10 points, leaving the pair just short of an overall majority in the Bundestag. In the same survey, the Greens are polling on eight per cent. Her only other option would be to try and mend the current loveless grand-coalition with the centre-left SDP, led by former EU Parliament chief Martin Schulz, but this thought to be a last resort measure.